In December 2015, Julian Assange made the disheartening statement that “mass surveillance is here to stay.” The Wikileaks founder said it’s already too late for “quaint notions of privacy and the right to privacy,” as costs for surveillance technology keep dropping, the infrastructure is already firmly established and politicians have no interest in preserving freedom. “The Anglo-American alliance, which is formalized in the the Five Eyes intelligence arrangement [of Australia, Canada, New Zealand, the UK and the US], which has an additional 35 states feeding into that system, is so pervasive in terms of mass surveillance of domestic and international telecommunications that while some experts can achieve practical privacy for themselves for limited number of operations, and terrorists are experts, it’s gone for the rest of the populations,” said Assange. 9/11 provided U.S. authoritarians the pretext to construct a vast, hidden world of surveillance that cannot even be quantified in cost or exact size. Even the bravery of Edward Snowden in exposing the abuses of the NSA appears too little to counter the advance of the surveillance state. Now, other members of the “Five Eyes arrangement” are being caught in their own scandals. The British and Canadian governments are finding themselves in hot water after their courts excoriated spy agencies for illegal mass surveillance operations. Also in Canada, a disturbing case of law enforcement carrying out highly intrusive surveillance on journalists came to light. The program of collecting “bulk communication data” – everything concerning the citizens’ phone and web communications – was started in 1998 and may indeed have been part of the inspiration for the NSA’s warrantless wiretapping and Prism programs. Of course, the British parliament is responding by pushing a bill to simply legalize using surveillance using surveillance leaving slim hopes for accountability for the 17 years of illegal rights abuses. On November 3, the Federal Court of Canada blasted its domestic spy agency for “unlawfully retaining data and for not being truthful with judges who authorize its intelligence programs.” This mass surveillance, virtually unknown to the Canadian population, was carried out for a decade before the court was fully informed of it. Canadian law enforcement are also using surveillance to push – and go well past – the boundaries of civil liberties in their effort to silence those exposing police brutality and misconduct. Montreal cops targeted La Presse columnist Patrick Lagacé and six other journalists by tracking their cellphone calls and texts and monitoring their whereabouts. Stéphane Bergeron, the Public Security minister at the time, wanted to find out who was leaking information to journalists, but professes to have no knowledge that then-director of Sûreté du Québec, Mario Laprise, had ordered journalists to be targeted in the probe. One of the ways the Montreal police surveilled Lagacé was to “track him by activating a GPS mechanism on his phone.” This gives us a small window into the capabilities of the modern surveillance state, which is the realization of George Orwell’s 1984. The goal of mass surveillance is not to actually make people safer, but to satisfy two desires of the centralized authoritarian State – increasing the power of government and directing taxpayer money into the gargantuan belly of the military-surveillance industry. American, Canadian and European technology companies are not only supplying their own governments with surveillance tools, but are exporting them to autocratic regimes around the world to aid them in repression. Human rights violations are no impediment to the expansion of mass surveillance, whether it’s so-called “first-world countries” such as the U.S. and Britain, or those countries routinely labeled by U.S. politicians as human rights abusers. 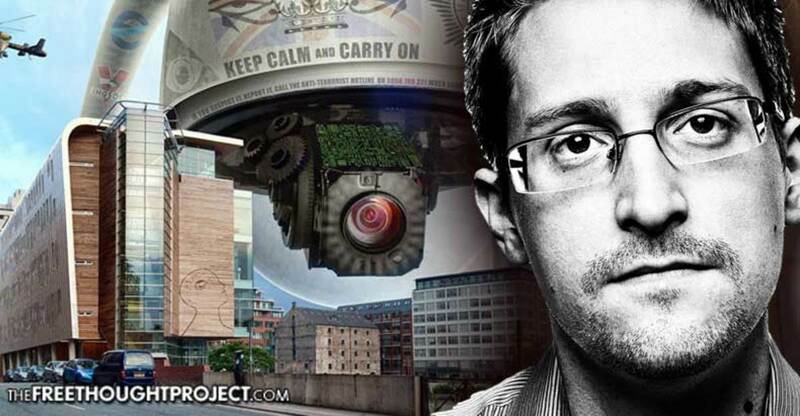 “When Snowden first spoke publicly, these were exactly the abuses and crimes he insisted were being committed by the mass surveillance regime these nations had secretly erected and installed, claims which were vehemently denied by the officials in charge of those systems.